A dental prophylaxis is the removal of plaque, bacteria, calculus and extrinsic stains by a registered dental hygienist. This cleaning is not sub-gingival, meaning your provider will not go underneath your gums to clean out any material - which for the average, healthy patient is not necessary. In our office, we recommend cleanings every 6 months with oral examinations by the dentist and updates on x-rays. 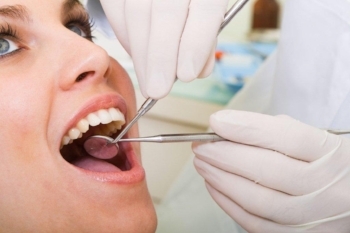 We also check the health of your gums and surrounding tissues at these visits, which takes approximetly one hour. Sometimes a regular prophylaxis just isn’t enough. A number of factors – oral hygiene practices at home, systemic diseases, genetics and pregnancy included – can cause you to fall somewhere on the spectrum of periodontal disease. Periodontal disease is, simply, infection of the gums due to the continued presence of harmful bacteria in the mouth. It can range from mild gingivitis, where the gums are inflamed due to the bacteria but no permanent damage has been done, to severe periodontitis, where you’ve likely already had significant loss of gum attachment, bone loss and tooth loss from the present active infection. Usually this means periodontal maintenance visits every 3 to 4 months; since everyone is a little different, our hygienists and dentist will work with you to determine the best course of action. Most commonly, crowns are necessary when decay has caused so much damage to the tooth that not enough natural structure remains for it to survive on its own. The crown then replaces the decayed area and provides protection for the remaining natural tooth. We are thrilled to utilize a CEREC machine, which allows us to fabricate many same day crowns on site in as little as one 2 hour visit! Dr. Toner has preformed thousands of CEREC same day restorations so you can be assured you are only get the highest quality of care! In only one appointment, CEREC 3D is able to restore your tooth using a state of the art method. How is this possible?The Answer- by using CAD/CAM (Computer Aided Design / Computer Aided Manufacturing) the latest state-of-the-art technology. Using a special camera, the dentist takes a picture of the tooth which needs to be restored. The image is then transmitted to a computer screen and can be further seen in 3D. With the help of CAD, the dentist is able to design the specific restoration required to repair your damaged tooth. CAM will automatically create the restoration for your dentist. In addition, the milling machine receives data from the computer and creates a customized inlay, onlay or even a perfectly matching crown. A denture is an oral prosthetic device designed to replace missing teeth. Conventional dentures are removable and may be full (replacing all teeth in the upper or lower jaw) or partial (used when some natural teeth remain in either jaw). These are further divided into maxillary (upper) and mandibular (lower) categories. Dentures are shaped to mimic your natural teeth and bite as closely as possible, and are traditionally held in place both by the suction created by the denture’s shape and the anatomy of your bone and tissue. Partial dentures are often built on a metal framework hooked onto existing teeth to keep the partial in position. Dr. Toner offers the choice of a metal-free partial along with the traditional metal partial. Sometimes, decay and/or trauma has done so much damage to a tooth that removal is your only option. In cases of wisdom teeth, your dentist may even recommend extraction proactively, before active damage has been done. Oral cancer screening is an examination performed by a dentist or doctor to look for signs of cancer or precancerous conditions in your mouth. The goal of oral cancer screening is to identify mouth cancer early, when there is a greater chance for a cure. Dr. Justen Toner is happy to provide a screening during your hygiene exam in about two minutes using VELscope! VELscope is a handheld scope that is used by dentists to help visualize oral tissue abnormalities, including cancer and pre-cancer. We personally do not charge a separate fee for the VELscope because we do not want cost to enter the patient’s decision as to whether or not to have the exam. We feel that our practice should provide the highest level of care, incorporating the latest technology in detection and treatment. A dental filling is a direct restoration used to repair a decayed or damaged tooth, and is often the first line of defense in a tooth that has been compromised. Implants are crafted from titanium. This material allows for bone infiltration, making room for osteoblast – the cells that make our bone – activity to take place. This leads to osseointegration, where the bone grows in and around the implant, which secures it in place and allows for its successful function. Want straighter teeth without braces? Choose Clear Correct! Clear Correct are clear aligners that show off your smile, so most people won’t even notice you’re wearing them. It’s easy to remove the aligners and eat whatever you like. There are no wires to trap food or get in the way when you floss. A mouth guard – also called night guard, occlusal guard, occlusal splint, bite guard, mouth piece, etc. – is a protective device that covers the teeth and gums to prevent and/or reduce injury. Whitening is completely safe! The only real risks associated with the use of these products are teeth sensitivity and gingival irritation, which should cease upon discontinuation of use. If you’ve experienced sensitivity in the past, it’s a good idea to begin using sensitivity toothpaste (we like Sensodyne) 1-2 weeks before you begin using your whitening product. Varying the duration and frequency of treatment, while often resulting in a longer whitening process, can also help keep sensitivity at bay. Root canal therapy is the process of removing the “pulp” of a tooth – matter comprised of nerves, blood vessels and other living tissue – when it has become so damaged or infected that leaving it would result in the loss of the tooth and a more serious, systemic infection. Depending on the level of complexity, root canal therapy can be performed by either your general dentist or an endodontist, a provider who specializes in this procedure.